Located overlooking the five islands on the southwest coast of Koh Samui, Thailand, Villa Beige is a luxurious, private holiday haven with four bedrooms and a beach-fronted design. The gorgeous swimming pool overlooks the endless seas and provides you an enticing view of the island that you get to enjoy incessantly. The modern and lavish décor of the estate adds an opulence to the entire villa, offering absolute comfort and luxury. There is something for everyone at Villa Beige with a private sauna, an office, and beach facilities! Villa Beige boasts of four fully-furnished and air-conditioned bedroom suites. There are two types of views offered that you can choose from, either the panorama of the natural vegetation or the ocean view. 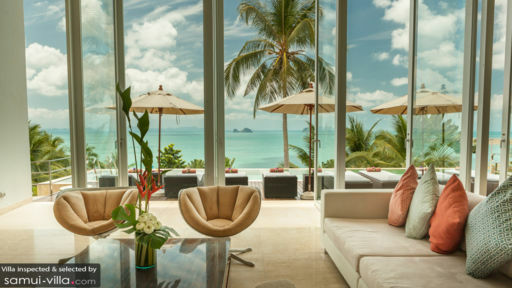 Each of the bedroom is equipped floor-to-ceiling glass walls that overlook the gorgeous island of Samui. The rooms have double bedrooms, a TV, a sound system, and iPod docking stations. Rooms offering panoramic views have their private terraces as well. The en-suite bathrooms are entirely marble, with tropical rain showers in Bisazza mosaic and terrazzo bathtubs. 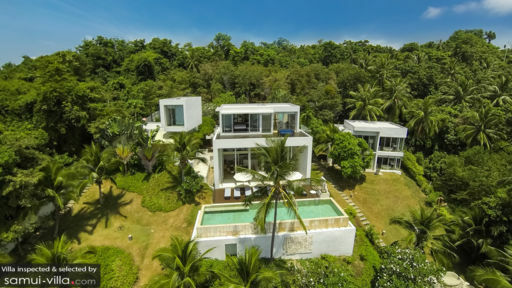 The sprawling property of Villa Beige is sat facing the beach with luscious greenery surrounding the entire property. The beautiful natural greenery enhances the tropical experience and you can relish the open air and sweet-smelling flowers all around you. The infinity-edge swimming pool overlooks the beaches of Koh Samui, giving you full and unhindered access to the panoramic view. While you enjoy yourself under the shade of towering palm trees, you can catch the sunset in time. There is an outdoor sala fully-furnished with cushioned sitting to make for a great place to enjoy the view. There are several sun loungers placed beside the pool, where you can lounge after a dip in the pool. The contemporary living area of Villa Beige is marked by floor-to-ceiling glass windows, to ensure that your view is unobstructed. The room is furnished with comfortable couches and sitting area with beige furnishings accented by colourful cushions to add colour to the room. The room is well-lit during the daytime owing to the large windows. The pristine and aesthetic space is super comfortable and the cosy atmosphere will make you feel right at home, immediately. The lighting is exotic and the modern decors gives it a luxe vibe. A flat-screen TV is also mounted on the wall, across the sitting area, so you can enjoy watching films or other shows while you enjoy the view. The serene atmosphere of the area, brings a calming and tranquil vibe to the living area as well, and you can relish in the meditative atmosphere to your heart’s content. The living area shares space with the dining area and kitchen. The wooden dining table has space for eights and the chairs or cushioned armchairs. The kitchen is a well-equipped western-style kitchen, offering all the necessary and modern appliances and amenities. The villa offers a variety of services to makes their guests comfortable and enjoy their time at Villa Beige. The services include a private chef who will prepare a lavish breakfast each morning, and offer western and Thai cuisines. There is a spa and sauna room where you indulge in Thai massages and spa treatments. There is a staff to look after your needs and requirements. There is a lot to see around Koh Samui especially the gorgeous sandy beaches, where you can enjoy water sports and other beach activities. Explore the quaint village markets, and the famous temples of the island and unwind at any one of the restaurants and beach clubs on the island! Thinking of travelling with a big family or a group of friends? This is the place to be! Depending on the purpose of your stay, if this is for pure relaxation you'll love it here! As soon as we (group of 12 friends/couples) landed, we were picked up by a 7 seater and took a fairly long ride to get to our villa, so have your bose speaker and ipod ready lol! After running around the whole villa that took about half an hour and taking a thousand photos of the magical scenery surrounding us, we finally settled down with our choice of room. We picked the secluded mini villa which is a pave way away from the main villa, just as awesome as the other rooms if not better! The bathroom is huge, consisting of a bathtub and a shower beautifully sat on the edge of the rock along the hillside looking out to a stunning view of a nearby beach, never imagined how pleasant it can be to take a shower haha. We spent half of the time in the villa making use of the private pool with the guys jumping/diving in and out and girls tanning by the side of it. We loved how we are served an extensive choice of breakfast each morning, from eggs to noodles (yes! those chili thai noodles that everybody loves) and pretty much anything you can think of. The chef knows what he's doing haha! The only reason why i didn't give it a 5 is merely the isolated location, which can be a good thing for some. Not a fan of travelling a long way to get to a nearby eatery, although most of the meals can be enjoyed in the spacious villa and in their very own bbq deck (hey you still need to drive somewhere to get food and drinks right?) Apart from the location, there are just too many reasons to come here. Here at Villa Beige you can enjoy a luxury of space, outstanding facilities and amenities, as well as privacy. Each bedroom is decorated with tasteful furnishing and you can never get any lazier to dip into the pool or enjoy a glass of whisky in the sun lounger! My husband and I have just returned from an absolute dream of a holiday at Villa Beige. Upon arrival, the first thing that struck me was the incredible view. No words can describe how beautiful the setting of this place is. Everything about the villa served to complement the amazing surroundings without comprising on facilities and luxury. When choosing accommodation, my priority was location and I didn’t choose wrong! We wanted something remote and quiet so for those looking for something more to do in the evenings this may not be the place for you. You would certainly need a car to get to the nearest shops etc. The villa is very secluded but this didn’t bother us too much as we were after a real escape from all the hustle and bustle. The villa also has its own gym, spa and private beach so there isn’t too much you need to leave for (and the onsite chef was excellent). The other thing I would highlight would be the amount of stairs. The villa is built on an incline so anyone with mobility difficulties (or very young children) might not appreciate the location. 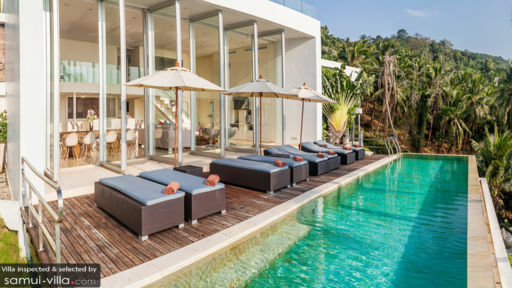 I would certainly not hesitate on booking this villa for my next vacation to Koh Samui. This place for us was faultless. Second time on Koh Samui but first time at Villa Beige. No words can do justice to the amazing Villa Beige estate! Spent one week there in Jan with my husband and our twin daughter and my mom. The villas were extraordinary, exceptionally large and the view is was fantastic! Defiantly the most keep secrete luxurious place we've ever been too. The most outstanding thing though about Villa Beige is definitely the outstanding service we received. The staff were incredible nice and friendly and everything we need its just there. Private spa was my favorite and anyone going has to try the Beige warm welcome treatment! The villa is set on the most beautiful, picturesque landscape and the view of the ocean from the villa are gorgeous! Charming beach must walks down a little step, our daughters love to swim there! Anyone deciding to visit koh samui should try look at Villa beige as it is unmatched in its class, service and luxury to any hotel and villa! Every little details is thought of at Villa Beige, from the interior design it was top. A big thank you to Suerte villa manager who catered to all our needs and saw that our stay there was nothing short of perfect!